Though I have stated this before, during an analysis of a previous transcription from Herbie Hancock's 1965 recording "MAIDEN VOYAGE"(Blue Note), nothing has changed and this recording remains as an almost 'perfect' embodiment of what "contemporary Jazz" should be about. It has everything one could ask for including memorable compositions, classic solos, stellar players, and a great elasticity in the way the art of music-making is approached. When the LP was released, I practically wore it out, and probably had to purchase at least one extra copy. As I began to view much of the work recorded by guitarists, as leaders, as a bit secondary to the depth of exploration by other instrumentalists, my focus shifted to the pianists and the horn players. Like virtually everyone else of my generation, when one mentions their heroes, the list, in general, is rather standard. 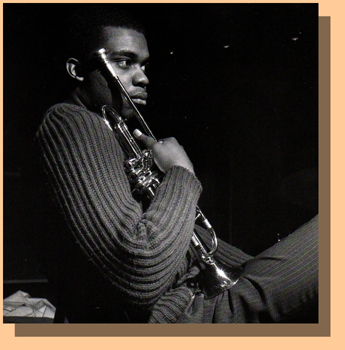 So, when it comes to a player like Freddie Hubbard, I practically can not find enough superlatives to express my admiration for his playing. What value can one attach to gifts such as:  a huge and beautiful sound;  wonderful phrasing;  a great time feel;  a special interpreter of melodies;  a fiery and inventive soloist; and,  a fine composer. He is all these things. And so, I remember, as part of my, then, self-taught Jazz education, trying to transcribe his solo over Herbie Hancock's "Dolphin Dance" as a great challenge. Even writing this analysis now becomes a challenge. Though it still remains a bit hard to believe, if memory serves, at the time, I don't believe that this great, great LP got much higher than a *** review in "Downbeat" magazine. Of course, this magazine has been viewed at the "Bible" of the genre for decades. Herbie's recording was being measured against the explorations of John Coltrane and his Quartet, Ornette Coleman's Quartet, and even the music the Miles Davis Quintet was about to present. 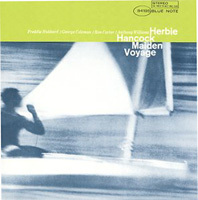 If one wants to view it in such a way, "MAIDEN VOYAGE" is like the Miles Davis Quintet, pre-Wayne Shorter, with Freddie Hubbard in the trumpet chair. Remember that this LP also featured: George Coleman(Tenor Sax); Ron Carter(Ac. Bass); and Tony Williams(Drums). It's hard to imagine a much better line-up than that! But all these great players were to become part of each other's music at varying times. In their way, each was a vital part of a family of players who left behind such a remarkable legacy for the rest of us to study and at which to marvel. Throughout the pages of Khan's Korner 1, I have always written, where transcribing is concerned, that the first step, before even really dealing with the solo, is to write out the tune, and to write out the solo format. In this regard, "Dolphin Dance" stands a truly remarkable composition. Yes, for all the expected elements, but more than melody and harmony, its structure and solo format are so very unique. Not many tunes carry such a memorable first 4 bars, and then, those 4 bars are never, ever heard again. This is extremely rare, and yet perfectly placed here. But strange because when one's ears embrace the melody and harmony presented in those bars, you would think that you might miss them later. And yet, you might not, until you begin to write out the piece and see that the 'repeat sign' takes you back to bar 5. This is a most fascinating and truly unusual aspect. For the purposes of discussion here, I decided to assign letters [A]-[B]-[C]-[D]-[E] to the various sections, and it is my hope that this will lend an ease to breaking down what Freddie played during his 2-chorus solo. There are elements within the section that I have labeled as [A], the first 12 bars of the solo format, which almost seem to have a 'minor blues' feel to it. The center would, of course, be C minor, but, we never see a iv chord, not F minor, nor F7. Prior to this recording, Hubbard, Hancock, Carter, and Williams had played together on Hancock's "EMPYREAN ISLES" album, and their familiarity with one another shows at all times. They all listen, comment, probe and prod and there is always a sense of give-and-take. What I love about Freddie's solo on this tune is that he is so flexible with his phrasing. Some phrases are right on it, almost metronomic in nature, and others are much more elastic, and are played expressively behind the beat. This, at times, makes it a difficult task to notate the solo to my own satisfaction. But, as I always do, I try to write what I felt the player meant to play. In bar 2 of this section, where the chord is Abmaj7#4, you will notice that Freddie ignores that chord, and simply implies the sense of G7(alt.) to pull back to the Cm7 which is coming in bar 3. This is a familiar device used by experienced and savvy players. That is, they will imply a chord sound with their line, which indicates a logical sonority which might have been there, but no one is actually playing it. In bar 5, I like the fact that he does not make too much out of the C#(#4), and only uses it as a lower neighbor to the more consonant fifth of Gmaj7, that being D-natural. Sometimes players will make such a big deal out of the Lydian note(#4) that it becomes more of an annoyance than anything else. Letter [B] includes two of the 3-4(depending on how you count) pedal point sections in this great tune. The first 4 bars, Ron Carter pedals a 'G' and then, for 3 bars afterwards, he pedals an 'F.' I love the way Freddie picks up on the bounce of Ron Carter's feel and accentuates the repeated quarter-notes in the first 2 bars. The chord colors over these pedals have been debated for about 40 years now, and I disagree with many of the lead sheets I have seen over the years. Bars 3 & 4 of this section, I chose to label as Dm9(maj7)/G and Cm9(maj7)/G. In truth, though somehow the other players 'make it work,' Freddie plays what is, perhaps, his only 'strange' note of the solo, a long G#. But, even if I had chosen to spell it as Ab, that note is not present in either of the two sonorities. This reminds me that, this particular solo is presented in "concert key" and not in Bb, which would be written one whole-step above what you see to accommodate the trumpet. It is also not written in the ideal register if a guitarist wanted to play along. On the guitar, this should be played one octave above what you see. Though I have no special knowledge about this particular session, and I have no idea as to whether or not these great players were afforded a rehearsal for the recording, it's hard to say just what the horn players were looking at. I would imagine that a great musician like Herbie Hancock would have written the horn parts, and their solo changes in Bb so that they would not have to be transposing. But, I can't say that for certain. If that was not the case, perhaps it accounts for Freddie's strange note choice with that G# in bars 3-4. However, if you went up a whole-step to Bb, or down a whole-step to F#, neither of those pitches resides within either sonority, making it all the more strange, and hard to justify. You might, and I emphasize might, be able to say that it was a 'blue note' over the Dm9(maj7)/G, but I think that this is pretty much "clutching at straws." But, speaking of 'the blues' - his phrases in bars 5-7 definitely illustrate that feeling! Again, this is an element which most players of some depth never leave out of their soloing. This might be a good moment to mention that, in most cases, there were almost never formal rehearsals for any of the classic Blue Note sessions. And so, the 'rehearsing' that was done was probably limited to the run-throughs prior to actually rolling tape and recording. If I could ever remember such things, I suppose that I would ask one of these great players whether or not they had been able to rehearse for this recording. However, it would not surprise me if the answer turned out to be, "No!" This makes these recorded performances all the more extraordinary. Now, let's get back to Freddie's solo. At [C], the hard swinging always seems to begin for each soloist. It is as though the Eb7(9b5) sonority signals this. It's remarkable what sometimes one chord change can do. In this portion of the 1st chorus, Hubbard's huge sound and style take over. I always love the little rhythmic grouping at the end of bar 3 which I very much associate with horn players of all eras in Jazz. As [C] comes to a close, after only 6 bars, there is a great Bebop line which shoots Freddie in [D] and the next of the pedal point sections, the B-pedal. The section which I have labeled as [E] is one where the chord changes are almost always written incorrectly in my view, but it would be easy to make an error in labeling them. And, it is possible that how I have labeled them might not agree with Herbie's original manuscript. As you can see and will hear, Freddie obviously feels totally conversant with the Bbm7 as he runs right up the Bb Dorian mode, but then, he stays very close to 'home' for the next two bars, leaning heavily on Bb's and outlining an Eb triad for the final two bars before the 2nd Chorus begins and we've arrived back at Cm7. In bar 2 of [A] of the 2nd Chorus, Freddie does the same thing that he did earlier. He, in essence, ignores the Abmaj7#4 chord, leaving the first-half of the bar empty and then plays G7(alt.) material, in the great Bebop tradition, to lead to a delayed cadence on Cm7. I also love how he anticipates the arrival of the Abm7 chord in bar 6 by playing a Db on the and-of-4. Though I really know very little about the trumpet, I suppose it is interesting to note that Freddie, almost always, leaves a nice space before changing register and playing higher. Such is the case just before bar 9 of this section. I particularly like his cadence to the Gmaj7 chord at [B]. Because of the presence of the note 'G' over the D7 chord, it seems to be indicating a sense of Cm, which in 'G' is part of the plagal cadence(iv-Imaj) and this is a nice alternative to the more oft-played D7(alt.) approach. With the G-pedal point section beginning, I like the way that his very active Bebop line signals the arrival of the G9(sus), which some might even label as Dm7/G, by the appearance of the F-natural on the downbeat of beat 4 of the prior bar. From there, he is very melodic and seems to focus his attention on outlining chord tones. Once again, with the arrival of [C] in Chorus 2, the hard sense of swing hits, and initially you can feel Freddie sitting on the bounce of Ron Carter's quarter-notes. In terms of note choices, I really love the sound of the C# on the downbeat of the Bm7b5 bar, and the fact that he goes up to an E-natural(the 4th) to finish the phrase. Then, again a space, and Hubbard is in his higher register as the solo winds down. Over the C#m7-F#7 bars you see all notes which conform to C# Dorian. At [D], as the B-pedal begins anew, he accentuates E-natural and D-natural, common tones to both Bm7 and Am/B(B Phrygian), with an F-natural thrown-in for good measure as a touch of 'the blues.' Just before George Coleman's tenor sax solo is to begin, picking-up the solo at what would have been the 4 bars of [E], Freddie uses one of my favorite melodic devices. That is this, his 'target note' is to land on an F-natural for the Bbm7 chord. But, before he actually sounds that note, he plays both its chromatic upper-neighbor(F#) and lower-neighbor(E-natural), which makes the F-natural sound so much more like a point of resolution. I suggest that, for those of you who are new to improvising, or even those of you who might have not explored this device, please try and integrate it into your playing!!! Like Wes Montgomery, J.J. Johnson and others, Freddie Hubbard was born in Indianapolis, and, like the others, his stature in the Jazz community has grown to legendary heights. I can't express enough just how much I still enjoy listening to Freddie's playing on any recording. If only to interpret a simple melody, he is, after all, a master at this. I am really glad that I stumbled upon this old transcription, and that this particular solo did not contain too many trumpet pyrotechnical displays. Otherwise, I never would have been able to write it out. No way! And so, here's wishing everyone a wonderful end to the Summer of 2007, and the arrival of a beautiful Autumn wherever you might be.